Head over to AOL Music to stream an exclusive Fischerspooner DJ set. I haven't listened to the entire thing, but it sounds just like what you'd expect from Warren and Casey. In the meantime, browse through Groovecat's photos of the group's performances at Manumission in Ibiza this summer. Sony Music was kind enough to share another free MP3 download from Sarah McLachlan's upcoming remix album "Bloom" with Arjan Writes readers. Check out Dutch DJ/producer Junkie XL and his remix of "World On Fire." Hot! "Bloom" is in stores next Tuesday. Check out Bebel Gilberto's brand new video for the remix of "Winter." This track was remixed by Finland's Nuspirit Helsinki and was taken from the Brazilian singer's remix album. Founded in 1998, Nuspirit Helsinki is a collective of DJs, producers and musicians who have their roots in house and jazz. Their reworked version of "Winter" is a wonderful, downbeat version of the original. 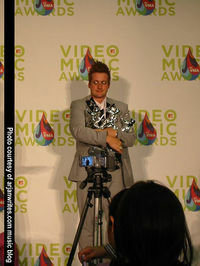 Green Day cleaned house today at the 2005 MTV Video Music Awards (see my photos of the event here). 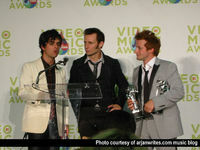 The punk-pop trio won an impressive seven awards at the show, included "Best Video" and "Viewers' Choice." I attended the event and had a chance to speak with Green Day, Diddy, Kelly Clarkson, Brandon and Ronnie of the Killers, Amerie, Paris Hilton, Heatherette and a bunch of other artists about music and gay fans. I'm still in the process of getting my notes and tapes organized to write one coherent story with some hot, exclusive quotes and interview audio for this blog. This year's show was a well-produced extravaganza that did not leave much room for any spontaneity (besides 50 Cent's feuding with Fat Joe at the end of his set). Diddy did a mediocre job hosting the event. My main criticism is that he put himself too much in the spotlight. This show is a celebration of music videos, not a Diddy lovefest. MTV should consider bringing back a comedian to host the show. Performances by Kanye West, Coldplay and Kelly Clarkson left a lasting impression. R. Kelly's "In The Closet" was a terrible performance that was not broadcast-worthy. The news about the shooting of rap mogul Suge Knight at Kanye West's private bash on Saturday night was ignored by most artists involved. West refused to speak with the press during the event to avoid questions. Video Premiere: Simple Minds "Home"
Popular '80s band Simple Minds ("Don't You Forget About Me") is making a coming back in September with the album "Black & White 050505." 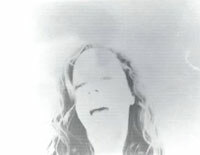 Check out the video for the first single "Home."